Dust, Dips, and Bear Tracks! On a warm Saturday, we began packing our supplies in preparation for our camping trip. The supposed destination was Bowman Lake, a large lake in the northwestern part of Glacier. Dad’s plan this summer was to go to new places and do new things. Camping in this far away place was very different. Anyway, we packed our duffel bags, sleeping bags, tents, and foodstuffs into the van. Even though it was only about 65°, we sweltered in the heat. After about an hour of packing our gear, we set out. Our first stop was the grocery, where we checked out ice, fire logs, and a couple of other picnicking necessities. After our quick stop at the store, our family began our journey past Columbia Falls. Soon we left civilization. Since it was Memorial Day weekend, we were accompanied by other cars along the black topped road. The mountains loomed above us, appearing craggy and magnificent. We drove along, nonchalantly admiring the scenery, when suddenly; the cars ahead of us hit their brakes! A sign warned us, “Pavement Ends”! Onto the gravel road we drove. The cars ahead of us created a huge cloud of choking dust. Soon we were engulfed by it. Luckily the windows were closed, but we could still smell the dust. Cars traveled like snails along the bumpy, un-maintained road. The bumps made so much noise; it made me feel furiously agitated. After about an hour of tortuous road, we reached a paved road. Although it did have many potholes, it was more bearable than gravel. Dad felt that our brakes were mushy and turned onto an obscure side road leading to the Polebridge Mercantile to get brake fluid. The store resembled the way it looks when I play store with E; various cans placed on shelves with other items I find around the house. 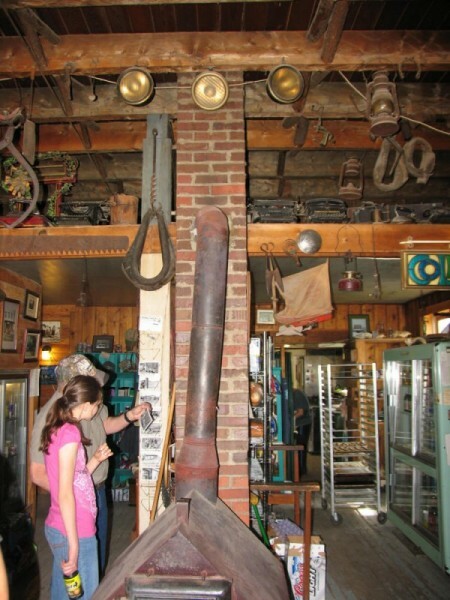 In the Mercantile, Mom seemed obsessed with taking pictures of the supposedly rustic store. It seemed Mom and Dad really wanted to buy stuff because Dad bought some silly looking postcards titled “Montana Rest Stop” and “Montana Double Date”. Mom bought a tiny loaf of fancy pizza bread and a magnet. After eating the scrumptious pizza bread, we headed back out to our destination. The washboard road resumed and we, at last, reached the entrance to the park. There was a line to the pay booth and Mom took photographs while we were in line. Dad asked the ranger which campground was better, Kintla Lake or Bowman Lake. The ranger said she was unsure. Dad chose Kintla. We passed lots of ATV’s on the rocky road up to the lake. It was so bumpy that it took us an hour to travel the 15 miles to the campground. There were only about 10 campsites, and we chose one near the creek where we could wade and cool off. While Mom and Dad had a chat with the ranger, in which they found out that a black wolf had visited campsite no. 5 just two days earlier, my sister and I traversed the campground. 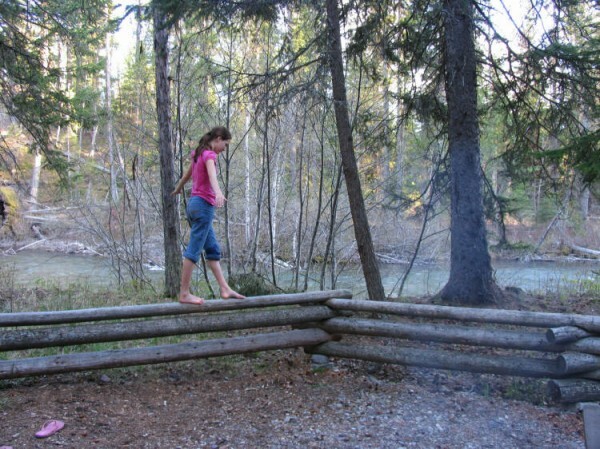 We discussed that the lake was an ideal place to cool off and that there were some excellent hurdles and balance beams around our campsite. I went to the pit toilet, and was a little disappointed because it wasn’t exactly a civilized rest room. At least it was clean. We set up the tents and got a couple of cans of pop to drink while we walked along an incredibly boring trail. The full distance was 12 miles, and Dad planned to take it the next day. After we checked out the trail, E and I waded in the chilly creek, then went to wade in the lake. When we returned, it was time to start the fire. Dad got a bunch of leaves and squirted charcoal starter all over it. When lit, the fire pit was aflame! A roaring bonfire leaped up about 4 feet into the air. Moments before, Mom had been sitting on the bench where the flames now were. Mom made hot dogs. We gobbled them up and then went to wade in the lake some more. Mom and Dad took pictures of the scenery while I waded around Kintla Lake. I was walking around in the water when I slipped and fell! My pants and shirt got soaked. Mom seemed extremely distressed by this and hustled us back to the campsite so I could change my clothes. 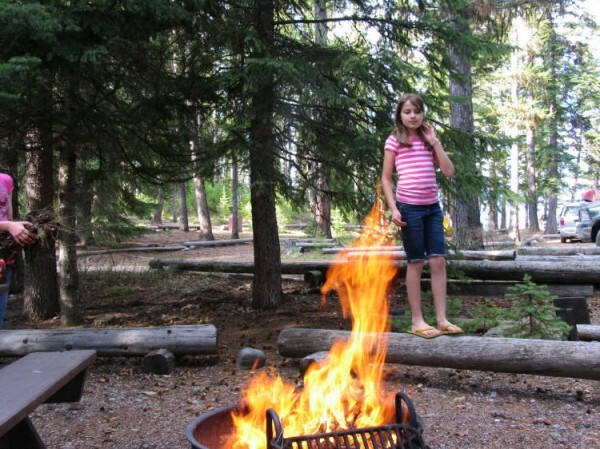 After I got into a dry change of clothing, we watched as a city of ants was consumed in the flames of our campfire. No one survived, although E insisted upon seeing ants escaping the deadly fire pit. Most of the time we sat around talking. I tried to get Mom to play her flute and imagined what would happen if she did. What would the few people in the campground think? I recalled the last time Mom played her Wind Spirits flute in the campground, and we heard emotional responses as she played each note. After a couple of hours we decided to retire to our tents for the night. I snuggled in my sleeping bag, and closed my eyes. I was soon sound asleep. I groggily left my tent to find my clothes still wet from my fall in the lake. I clumped back into the tent only to be told to get dressed. For once my mummy bag was cozy and I was supposed to leave it at 5:00 in the morning! I lazily lay in my sleeping bag as E bravely got dressed, then I followed suit. As I got out of the tent, Dad proclaimed that we wouldn’t go on the boring trail along Kintla Lake, but the boring trail in the hills near Bowman Lake. We packed up and headed down the rough road to Bowman Lake. It took 52 minutes to get to the junction of the roads to Bowman and Kintla Lakes. At Bowman Lake we put on our packs and gear. The trail went through the forest. E noticed a deer mandible along the side of the trail and Dad observed hair all around the trail. Upon further investigation, we saw deer bones and legs-all crunched up by the powerful jaws of a predator-probably a bear. 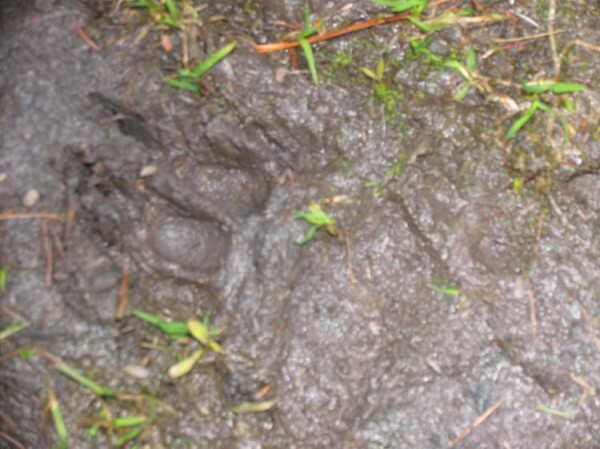 Farther along the muddy trail, we saw distinctive bear prints. Luckily, everyone had bearspray and nobody smelled bear.The trail went through the woods and was very boring so we turned around and went back. After the hike, we got back in the van and went back down the bumpy road. As we were traveling along, a very fast truck sped past us and engulfed us in dust. He got far ahead, and mysteriously he and his trail of dust disappeared around a curve. Perhaps the speeding driver flew off the road – we may never know. After a long, bumpy, dusty ride, we hit black-top. It felt like we were gliding on smooth ice and pretty soon we reached home – sweet – home. Bear Encounters, Camping, M & E's Excellent Adventures, Outdoor Adventure bear, Bear Encounters, Glacier National Park, Montana, outdoor adventure, tent camping. permalink.